On one hand, it’s a fitting reflection of the topsy-turvy season in England that, heading into the final four of the FA Cup, the competition’s best remaining player isn’t a world-famous, well-decorated superstar for Chelsea or Manchester City or Arsenal, but rather trophy-barren Everton’s 22-year-old striker. 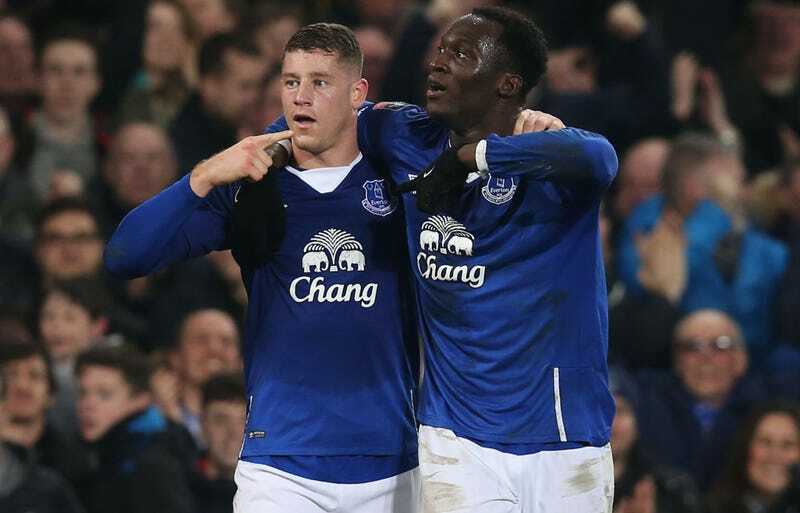 On the other, judging from said striker’s increasingly dominant performances over the years, it’s probably only a matter of time before Romelu Lukaku finds himself a member of soccer’s superstar caste. He uses his positional sense and situational awareness to split Chelsea’s two center backs (okay, not that that was all that hard against some pretty terrible defending) while pointing exactly where he wanted the ball played; simultaneously demonstrates his quickness and strength by squeezing between Branislav Ivanović and César Azpilicueta before muscling off the latter’s attempt to basically hop onto his back like an older brother shrugging off a rowdy younger sibling; stutter-steps past John Obi Mikel; then, in a masterclass of subtle body positioning, completely spins around Gary Cahill with little more than a couple dips of the shoulder and swivels of the hips before sliding the ball past Thibaut Courtois from a tight angle. While maybe not as viscerally compelling at first glance as some of the more flamboyant runs you’ll see, it nonetheless exhibited a whole array of abilities required of a world-class forward—a level that, if Lukaku hasn’t reached already, he’s coming nearer to every day. The young Belgian’s brace against Chelsea put him at 25 goals in 36 matches in all competitions, already his highest ever tally. His 18 league goals are just one fewer than golden boot-leaders Jamie Vardy and Harry Kane. Everton have maybe been a little disappointing this season, sitting all the way back in 12th place in the league despite a squad armed with loads of talent in a wide open field, but Lukaku has unquestionably strengthened his reputation as one of the best young strikers the world over. The natural impulse after a game like Lukaku’s this weekend—and his entire season, for that matter—is to wonder where he goes from here. Is Everton too small a club for a player of his caliber? If so, is he already good enough to start for a real Champions League contender? Which of the world’s biggest clubs have both a need for and the means to acquire him? While, speculative as they may be, it makes sense to ask those questions, there is a more important concern that underlines all of those and keeps the focus on where it should be, on the pitch itself. After coming so far already—from Anderlecht to Chelsea to West Brom to Everton, at all times evincing glimpses of future greatness and slowly but surely making good on that promise—exactly how high in the sport’s hierarchy can these talents of his take Lukaku? The answer, first and foremost, is at least to the FA Cup semifinals with Everton. It is our unique privilege to watch where he goes from there in due time.